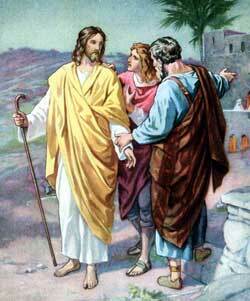 HE PASSOVER FEAST had ended, and some of the visitors at Jerusalem were returning to their homes. Along the roadway leading from the city of Jerusalem to the village of Emmaus, seven miles distant, two men were walking slowly, with bowed heads. They were friends of Jesus, and they were troubled about the news that had come to the city just before they started on their journey. As these men talked together about the trial and crucifixion of Jesus, and about the women's message that early morning, suddenly a stranger joined them and asked, "Why is it that you are so sad? What are you talking about so earnestly?" The men replied, "Can it be possible that you have not heard about the sad things that have been happening during these few days past?" And the stranger asked, "What things?" "And this is the third day since these things happened," they said, "and this morning some women of our company astonished us by saying they had gone early to the tomb and had seen that his body had been taken away. But they said angels were there, and the angels said he had risen from the dead. Then some of our own number hurried to the grave and found that it was indeed empty, but they did not see the angels nor did they see our risen Lord." The stranger listened patiently, and when they had finished he began to talk to them about the teachings of Moses' law and of the prophets concerning the promised Redeemer of Israel. He showed them by the word of God's book that Jesus, the prophet of Galilee, should suffer these very things and rise again the third day if he would really be the Redeemer for whom they were longing. Now every one seemed happy, and excited about something. "Jesus is indeed risen,"they cried joyously, "for Peter has seen him!" Then the men told how he had appeared to them on their way to Emmaus, and how they had not known him until he had blessed and broken bread at their evening meal. But he spoke to them and said, "Why are you fearful? See my hands and my feet; touch me, and see that I am not a spirit, for a spirit does not have flesh and bones as I have." He said, "Except I see in his hands the print of the nails and put my fingers into the nail-prints, and except I thrust my hand into the place where the spear cut his side, I will not believe." Then Jesus appeared as suddenly as he had come before, and he said to them all, "Peace be to you!" While they were wondering at his strange coming he called Thomas and said, "Behold my hands, and put your finger into the print of the nails; and put your hand into the place where the spear cut my side. And do not doubt, but believe." Now Thomas worshiped Jesus, saying, "My Lord, and my God!" To him Jesus said, "You believe because you have seen, but blessed are those who will believe though they do not see me."